Keep Your Airfield in Part 139 Compliance, 24/7. Hi-Lite’s airfield maintenance services and products are available through competitively solicited cooperative contract #062817-HLA. Hi-Lite's modern, specialized equipment and dedicated, well trained staff make Hi-Lite the premier airfield rubber removal contractor. Hi-Lite is the world leader in airport pavement markings, runway rubber removal and airfield maintenance. Airfield services on an international level. Visit any of the Hi-Lite office locations to see where airport safety begins. In-depth information relating to services offered by Hi-Lite Airfield Services. 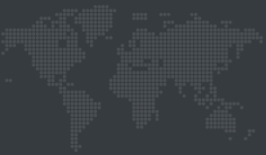 Find out how we do our job. Ready to get started? Request a Quote today to get started. A representative will contact you to gather details. 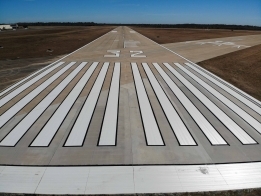 Hi-Lite Airfield Services, LLC is the leading Airport Runway and Taxiway Marking contractor in North America. Hi-Lite is an industry leader in runway rubber removal and paint removal, surface preparation, pavement maintenance and friction testing. DON’T LET MILDEW TAKE OVER YOUR AIRFIELD! 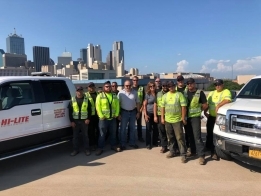 Bub and his crew were very professional, easy to work with and completed the project with the quality we have experienced on past Hi-Lite projects. We appreciate the efforts put forth by Hi-Lite Airfield Services, LLC and look forward to working with your company again. We will definitely keep you advised of any future marking or sealing projects. We are very pleased with the work that Hi-Lite Airfield Services accomplished for us recently. I have been assigned to the airport for nineteen years and I can say the painting/striping on the runways and taxiways is the best it has ever been. The accuracy of all the striping could not be better. I would also like to say that your crew lead by Ben was extremely professional and the "Spirit of Cooperation" they demonstrated was outstanding. We believe Hi-Lite is among the highest echelon of contractors in the industry. They are respected by their customers and as importantly they respect their customers. We would heartily recommend them for any assignment. Your crew did a great job and were extremely easy to work with. We look forward to working with you again in the future. I just wanted to thank the Hi-Lite team for their excellent work at the Tallahassee Regional Airport! It was a pleasure working with Bub and his crew. We all worked long hours and his determination to get the job done in a timely manner with high standards made the time fly by. He and his crew's experience was very helpful in moving about the airport safely. Bangor International Airport has utilized Hi-Lite Airfield Services, LLC under contract for runway removal for at least six years with no problems at all. Their equipment has been demonstrated as being mechanically and operationally capable of performing the work specified. I would highly recommend them to any airport for rubber removal or painting. Even though there had been a NOTAM released, there were several "special" flights that all of the crews had to pull back for, your guys still completed their work inside the allotted runway closure time. It was a pleasure working with your personnel. They were very professional and thorough. The airfield markings and rubber removal on the runway looks top notch. Thank you and your team for bringing us up to standards on our airfield. Thank you for your performance efforts under the Traffic Control Painting Requirements Contract for Fort Drum, NY. The efforts you and your employees have taken throughout this project on Fort Drum are highly appreciated. 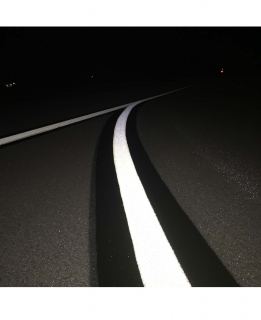 Your company's commitment to quality workmanship and professionalism ensured successful completion of all highway striping delivery orders. Thank you for your dedication to ensuring safe Fort Drum highways.